Planning a holiday to Phan Thiet can be challenging, especially for first-time visitors. Also commonly known as Mui Ne, this coastal town is located 200 km north of Ho Chi Minh City and features many unique natural landscapes and traditional lifestyle. There are also resort-style developments along the coastline, where you can enjoy a variety of water sports as well as restaurants offering fresh seafood at very affordable prices. Check out our Mui Ne survival guide below, where we’ve listed some of our favourite attractions, restaurants, shopping venues, hotels, and places to unwind in the evening. Phan Thiet is divided into two areas, which are the city centre and Mui Ne Beach. Phan Thiet city is great for experiencing the local lifestyle, as you can explore traditional markets, local restaurants, and Buddhist pagodas that are over 100 years old. The beach is highly popular amongst travellers thanks to beach resorts and hotels, retail and souvenir outlets. Mui Ne Beach is also the premier destination in Southeast Asia for kitesurfing. Mui Ne and Phan Thiet are known for their stunning beaches, tropical forest and sand dunes. There are also ancient structures such as the Po Shanu Cham Towers and Van Thuy Tu Temple, but they’re relatively far from the city centre, so you may need to rent a motorcycle or join a tour to get there. However, the iconic Red Sand Dunes are only 5km away from Mui Ne Beach, where you can ride ATVs and slide down the slopes on plastic sleds. Phan Thiet’s local markets are where you can shop for local produce and Vietnamese dishes such as fish pho, banh xeo, and spring rolls. You won’t find multi-storey shopping malls or fancy boutiques in Phan Thiet and Mui Ne. There are a handful of retail stores along Mui Ne Beach that sell local handicrafts, imported beachwear brands, and beach essentials such as sunscreen and sunglasses. Nightlife in Mui Ne and Phan Thiet is very relaxed. Many hotel bars, late-night restaurants, and hippy lounges are located on Mui Ne Beach. These venues attract travellers with friendly service and reasonably-priced drinks and food. During popular holidays such as New Year’s Eve or Christmas, you can enjoy vibrant parties, cultural nights, movie screenings, bonfires, dance performances, and guest DJs. Restaurants in Phan Thiet and Mui Ne offer not only authentic regional dishes and fresh seafood from the East Sea, but also cuisines from all over the world. Affordable local eateries and markets are mostly located in Phan Thiet City Centre. 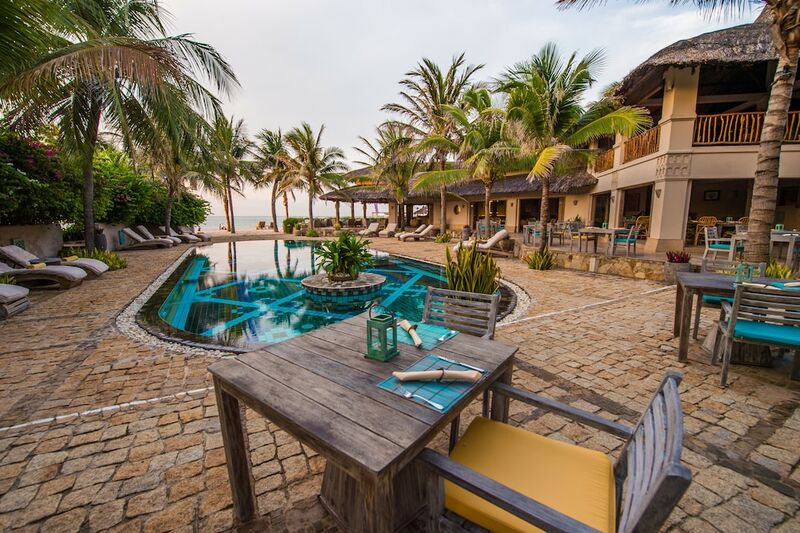 Travellers looking to splurge on a romantic dinner by the beach can head to Mui Ne Beach, where they can find expat-owned restaurants and luxury resorts with beachfront dining venues. Phan Thiet and Mui Ne have a good mix of hotels with clean rooms, diverse dining options, and easy access to popular landmarks. Mui Ne Beach is home to many five-star beachfront resorts, while mid-range and budget hotels are found within the town centre. 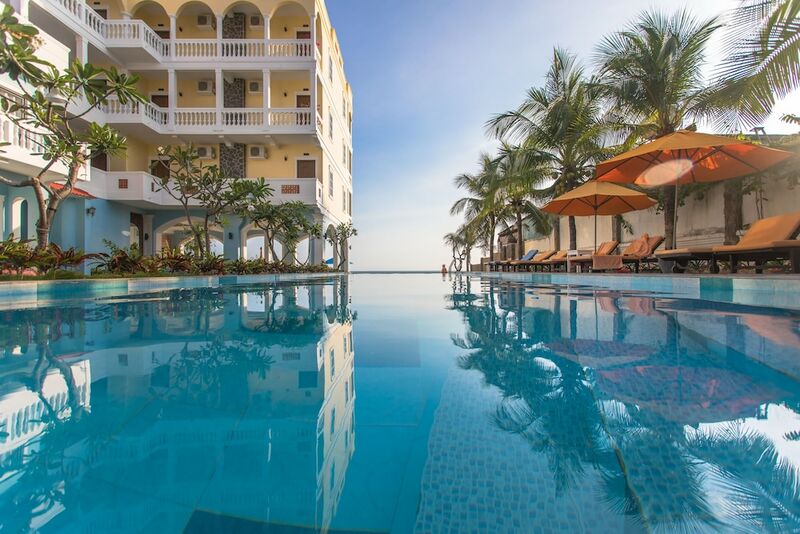 We’ve compiled three of our favourite places to stay in Phan Thiet, each catering to different budget levels and preferences.